200 years might not be infinity, but it’s certainly a long time to be producing whisky. Ardbeg distillery, nestled on the coast of Islay, is to be heartily congratulated for reaching such a momentous milestone. The distillers at Ardbeg love a good special edition release, and in celebration of their big birthday they have brought forth the Perpetuum. The whisky celebrates the love, dedication and skill of its creators, acknowledging that while times and technology change, no machine will ever be able to recreate the spark of the human touch. It’s certainly a beautiful object to gaze upon, with shiny silver labels, a Celtic braid infinity symbol and PERPETUUM surrounding the box in monolithic black letters. Oh my goodness the 47.4% spirit inside is a worthy representative of Ardbeg’s art. Just to look at it’s a gorgeous pale, silky gold with a subtle peach tinge. The nose is delicate and creamy, and has delicious buttery shortbread infused with a hint of sea salt. Twining through is a touch of fine smoked meats, smouldering driftwood and hot malt. The first sip delivers rich, woody smoke to float over the tongue. Underneath sits a pool of salty mineral-rich water with the occasional mandarine bobbing around in it, counterpointed by a sharp bittersweet herbal finish that lingers on. As the bottle says, it almost seems to be never ending. The Perpetuum is a snapshot of the last 200 years of whisky making at Ardbeg, and hints at the way forward into the next 200 years. Like the infinity symbol the represents it, hopefully we will be coming back to the Perpetuum, and indeed all Ardbegs, again and again for many years to come. I tried this for the first time about two weeks ago at Whisky & Alement in Melbourne, alongside the Laphroaig 15 Years. It reminded me of the Auriverdes somewhat, but with a slightly more intense flavour profile . I did enjoy that tiny hint of sherry in there though, which made it sit somewhat apart from the Auriverdes (although in all honesty it does not go near the affection I have for the Uigeadai). Quite a good dram though and I’m definitely intending to purchase a bottle of this momentous whisky for my collection. Wow this sounds like a real mouthful, the Ardbeggians say “tar, soot and pine resin…leads into dark chocolate, treacle toffee, coffee grinds”- sounds like chewing on a baseball bat that got in a fight with a chocolatier. Can’t wait to get a hold of some…and it looks like the staties have selected it for sale. 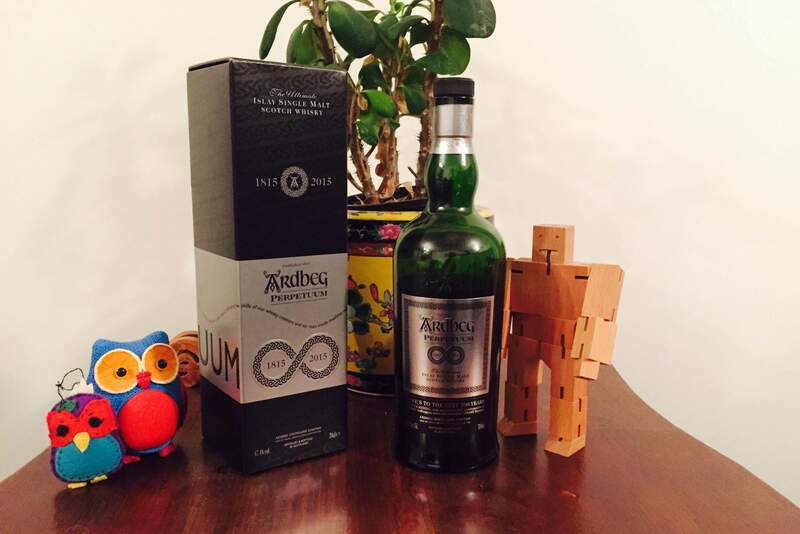 I tried this whisky during an Ardbeg Day event and as the review says, it’s another great addition to the Ardbeg collection! I was able to snap up a bottle, which stands as of yet unopened in my cabinet. Although it’s very tempting to open it, I do feel like this limited edition has not quite reached the heights of Galileo or Ardbog. Since the price has doubled in a mere six months, I may yet be tempted to sell it and trade it in for something equally good. Like Brendan says, the Uigeadail would definitely not be a bad option!